The Apollo 55100-905 is an addressable call point from the Apollo XP95 range of fire alarm system equipment. The Apollo 55100-905 comes supplied with a test / reset key and a surface mounted backbox. The Apollo 55100-905 is ideal for use on final exits from buildings and also on doors leading onto stairwells. It is compatible with the KAC resettable plastic elements which mean that the glass does not need to be replaced after an alarm activation. 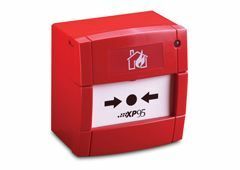 Apollo 55100-905 Call Points are designed for use on Apollo XP95 protocol fire alarm system loops. Various manufacturers of control panels produce Apollo XP95 protocol systems including C-Tec, Kentec, Advanced Electronics and Morley IAS. The Apollo 55100-905 break glass units are also compatible with the KAC PS200 hinged call point covers which are ideal to help prevent accidental false alarms. If you’re interested in this product you may also be interested in our Apollo Fire range and Fire Alarms ranges.